A unique, decorative mirror can easily be the highlight and focus of a bathroom’s decor. When considering a selection of decorative mirrors for your bathroom, ask yourself whether or not a particular mirror will complement the overall look of your powder room. The trick is to search through the incredible selection of powder room decorative mirrors and come away with one that will both fit into and enhance your bathroom’s decor. A bathroom that features marble tile along with gleaming silver faucets, and towel racks deserves a mirror with elegant flair. The choice of a hanging mirror with a sleek, silver frame would be one appealing option. Another choice might be a small tabletop or hand mirror lined in silver. 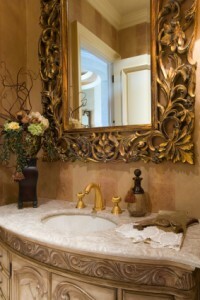 If the fixtures were gold in color, a mirror with gilt-edging would also be attractive. The elegant, understated décor of this bathroom deserves a mirror that possesses the same qualities. A powder room located in an older home or even a farmhouse, may have an old fashioned style of décor. Perhaps there’s a free-standing porcelain bath tub and sink. The fixtures in the bathroom such as the towel racks and the faucets were designed with a sense of practicality in mind, instead of decoration. Faded wallpaper on the bathroom walls still reveals its pleasant design of sunflowers. The quaint, sunlit atmosphere of this bathroom would be enhanced by a medicine cabinet style of mirror made with white or light-colored wood. A mirror with a frame that has the look of weathered wood is another suitable option. A small, circular mirror with a subtle gold design decorating its frame would also complement the bathroom’s traditional appearance. A modern apartment may possess a bathroom that carries a theme of stainless steel. The sink, faucets, shower, and even the towel racks are all made of that particular material. Tiles of gray or black cover all areas of the floor and walls. A frameless mirror in an oval or square shape would suit the darker, subdued décor of this bathroom. A few bathroom lights installed near the mirror would cast a soft light over the reflecting stainless steel fixtures throughout the room. A bathroom that displays such a precise style of design needs a mirror with no unnecessary or distracting features. Unfortunately due to its size, a half bathroom can have a cramped, uninviting atmosphere. However, a brand new coat of paint and the perfect decorative mirror can turn even the tiniest half bathroom into an appealing space. Certain painting techniques incorporate lighter shades of paint to create the illusion of more space in a room. In fact, it is amazing how a new shade of paint can help to brighten, and open up the atmosphere of a small bathroom. After the walls have a renewed look, an oval or square mirror surrounded by a frame with a unique, elaborate design can go along way to improve the décor of almost any half bathroom. An upstairs bathroom that is used by a large family is a perfect place to hang decorative mirrors. Imagine that this particular bathroom has a long countertop containing two sinks. One sink is for the adults in the family and the other is used by the young children. One choice of a decorative mirror for the adults to use might be wide and rectangular with a polished bronze or gold frame. Alternatively, the children’s mirror would be a smaller version of that mirror, hung at a lower level to accommodate the grooming needs of the kids. A decorative yet durable hand-held mirror is another fun alternative for the young children to make use of. Pendant lights would also be an effective and appealing addition to this busy bathroom. A set of pendant lights with shades that complement the colors of the bathroom walls and tile would be an attractive way to light such a large area of bathroom counter space. The addition of a decorative mirror is a simple, imaginative way to add new life to the appearance of a bathroom. Whether your bathroom’s style of décor is traditional, modern, unique or a combination of three, there is certainly a decorative mirror that will serve to enhance the look of the room.